On 26 April 2018 we conducted the third workshop with students from “St. Paisii Hilendarski” Secondary School including a child with Down syndrome and other accompanying illnesses. Mrs. Grudeva presented the project to the participants, introducing the goals and the tasks of the project. To achieve these goals the participants played mobile games and the aim was to turn the non-learning moments into learning ones and to associate learning with enjoyable experiences. 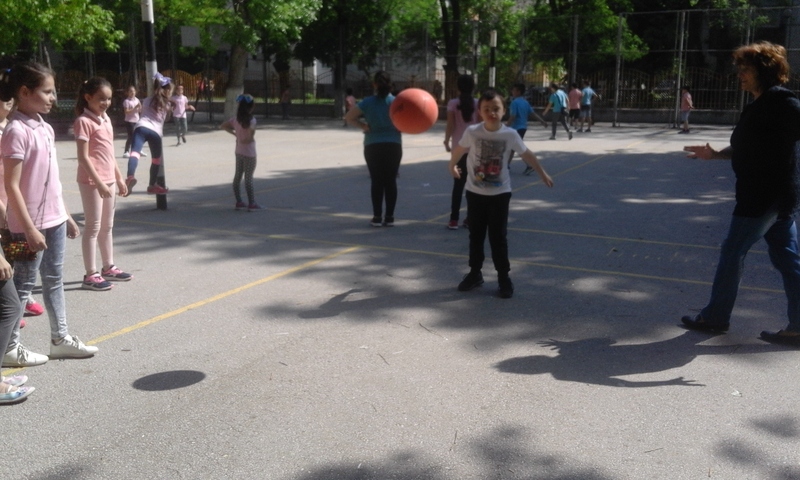 From our observations we knew that the student liked to play with a ball, but at the beginning of the game he was afraid. He was watching the ball from a distance. At one point he joined the game, imitating the other students and to some extent assimilating the rules of the game. The children’s tolerance encouraged him, and soon he became more confident, braver, and he successfully began to catch the ball and hand it over. After the successful throwing, he became really happy. He even climbed high and the ball was always with him. From this activity we understood that the strategy for working with children with Down Syndrome is effective only if multiple combinations of active working methods are involved, such as combining mobile and role-playing games, observation and experimentation. This workshop lasted about 10 minutes. The workshop was organized by Mrs. Nina Grudeva and Mrs. Silva Ikimova as a third workshop within the project aiming to raise pupils’ awareness about the benefits of practicing different sports.